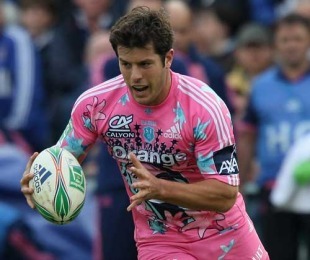 Stade Francais will be forced to field Scottish international fullback Hugo Southwell at scrum-half for their Heineken Cup showdown with Bath at the Stade Jean Bouin on Saturday. The French giants are still reeling from the 23-week ban handed to Julien Dupuy for gouging Ulster's Stephen Ferris in a previous round and count Charlie Davies and Noel Oelschig among a lengthening injury list. Their final option at No.9, Benjamin Tardy, is not registered for European competition. Stade coach Jacques Delmas believes that Southwell, who started at fly-half in a victory for Scotland 'A' over Tonga in November, has the skill-set to succeed this weekend due to his experience in youth rugby. "[Southwell] played at scrum-half until the age of 18," Delmas told AFP. "Considering the weather conditions that we'll be facing, Hugo has a left boot worth considering and a very good pass. He's also very good at cover defence. "We've got total confidence in Hugo. With Didier Faugeron [assistant coach], we decided it was the best choice to make."